The Arkansas History Commission will be closed for Labor Day on Monday, September 1. The Arkansas History Commission is pleased to announce the opening of several collections of gubernatorial papers. Over the last year, the gubernatorial papers of Charles Hillman Brough, Harvey Parnell and John E. Martineau have been conserved and have had updated guides created and are now newly available for research. Each collection holds a variety of archival documents. The Parnell and Martineau papers contain political and administrative documents from their time in office with little personal material. The Brough papers contain both personal and gubernatorial records, including photographs, personal correspondence and scrapbooks. In 2013, the History Commission was awarded a grant from the Arkansas Natural and Cultural Resources Council in the amount of $48,500 to conserve and create guides to 16 major collections of Arkansas gubernatorial papers and another 22 small manuscript collections. Along with the three opened gubernatorial collections, 15 of the 22 small manuscript collections have been conserved and are open for research as well. The collections can be viewed in the AHC’s research room from Monday through Saturday, 8 a.m. until 4:30 p.m. Nothing can clutter up a space like working on multiple projects all at once and no one at the Arkansas History Commission is working on any single project at one time. So sometimes we can appear a little bit cluttered. The AHC did its own version of ‘spring cleaning’ during the week of the 21st of July. For that whole week, every individual at the Little Rock History Commission stopped all projects to clean, reorganize, throw out, and relocate items in every room, office, lab, and vault within these well-used rooms. We made the cleaning project enjoyable by having a different get-together each day with food and conversation about what we had found and to celebrate everyone’s hard work. Here are some before and after photos of the big clean up. 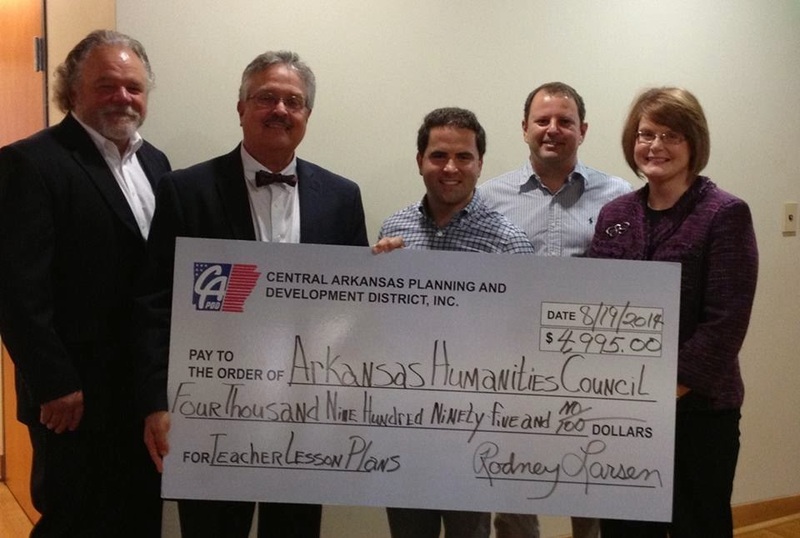 The Arkansas Humanities Council, in partnership with the Arkansas History Commission, is pleased to receive a grant award in the amount of $4,995 from the Central Arkansas Planning and Development District, Inc.
Funds will be used for the development of teacher lesson plans from primary source documents found within Arkansas History Commission archives. Pictured below (L to R): Rodney Larsen, Executive Director Central Arkansas Planning and Development District, Inc., Paul Austin, Executive Director, Arkansas Humanities Council, Representative Warwick Sabin, Brian Irby, Archival Assistant, Arkansas History Commission, and Dr. Lisa Speer, Director, Arkansas History Commission. Our monthly newsletter, The Arkansas Archivist, is out for the month of August. Be sure to check out the section called, "From the Director," written by Dr. Lisa Speer. Dr. Speer discusses some upcoming changes to our policies. Topi...cs will include Cherokee Code Talkers: World War I and Beyond, American Indians in World War I: Choctaw Case Study, and Letters, Scrapbooks and Discharges: WWI Treasures at the Arkansas History Commission. The Arkansas History Commission, located in Little Rock, is the official state archives of Arkansas and maintains the largest collection of historical materials on Arkansas in the world. Associated with the University of Arkansas at Little Rock, the Sequoyah National Research Center maintains the largest collection of Native American expression in the world and works to acquire and preserve the writings and ideas of Native North Americans. For more information about the symposium, call Dr. Lisa Speer at (501) 682-6900 or Dr. Daniel Littlefield at (501) 569-8336.